Into this fray arrives We Wanted Workers: Unraveling the Immigration Narrative by George J. Borjas, one of America's top labor economists and a specialist in immigration. The book's title refers to Max Frisch's insightful quip: "We wanted workers, but we got people instead," speaking about millions of guest workers in Europe. Borjas studies immigrants as more than labor inputs or workplace robots to foster economic growth. Immigrants are people, and that means complexity: They bring cultural, historical, and economic baggage. Borjas has spent decades working on the nuts-and-bolts of getting answers from the data about immigrants. Instinctively, he avoids being the economist-for-hire to support a ideological narrative. He prides himself on figuring out the "how-to's" for assessing questions like why immigrants assimilate/don't assimilate economically. One of the first issues Borjas tackles is the argument for "open borders"--if immigration is good for everyone, why have restrictions? Or as he puts it, the utopia of John Lennon's "Imagine." The chief beneficiary, according to computer simulations, would be capitalists. Some workers would gain, others would lose. Those on the short end of the stick compete with "fake-documented" workers crossing our too porous borders [which Borjas argues must be secure before we think about changing immigration policy], low-skilled and willing to work for less. Low-skilled natives are understandably not charitable about immigration. At the other end of the spectrum, high-skilled immigrants tend to complement, not substitute for, native workers. A win-win. One reason Australia and Canada intentionally skew immigration policy toward high-skill and/or high net worth individuals. Whatever the outcome of the debate, our immigration policy reflects our values as a country. Borjas expects a mix of taking in the "huddled masses yearning to breathe free"--America historically "does good" that way--and accepting high-skilled immigrants with immediate payoff for our economy. 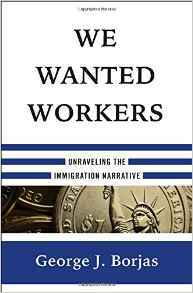 We Wanted Workers is a must-read by an immigration economist that pushes past the trigger rhetoric to an understanding of the complexity and assumptions that affect a key public policy. Borjas gives us some critical tools to unpack this ongoing debate.